The 89-year-old is the Rockingham-based club’s last remaining founding member after joining as its fourth member in 1956. The club secretary introduced membership numbers, giving himself number one, the barman number two, his wife number three, and Mr Meacham number four. Whether the numbers were allocated in priority order remains uncertain, but Mr Meacham is proud to be the fourth member. Mr Meacham was an engine room artificer in the Royal Australian Navy during World War II, serving two and a half years on HMAS Latrobe escorting convoys throughout the Asia-Pacific. Despite the ever-present threat of submarines, mines and aircraft attacks, Mr Meacham only recalls good memories from his time at sea. ‘I always enjoyed being out at sea. We would tie a net to the end of the ship when it was anchored, and play water polo for recreation,’ he said. 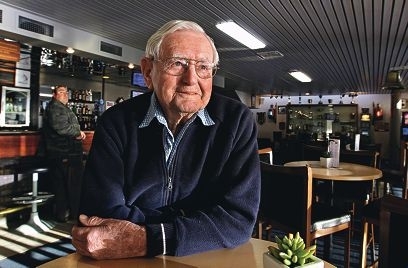 His father, a member of Claremont Yacht Club, had him sailing an old clinker boat by the time he was eight and after returning from the navy, Mr Meacham worked at his father’s Rockingham service station before joining the TCYC, borne out of the local Friday Club. The Town Planning Commissioner and Rockingham Roads Board granted approval for the clubhouse and a steering committee purchased land on Val Street from Reginald Grigg for 4000 pounds, including the use of three old jetties for a pound. The inaugural Cockburn Sound Regatta attracted close to 160 entries in 1957 and Mr Meacham said he remembered the hype surrounding the race. ‘It took place on one of the finest stretches of deep water in the Commonwealth for yachting,’ he said. Mr Meacham held several prominent positions within the club, including vice-commodore, and was involved in club rescue operations. His children grew up learning how to sail at the club, frequently competing in twilight races. Today, Mr Meacham enjoys a weekly beer at the club while watching younger sailors compete alongside the seasoned professionals at the ‘new’ clubhouse.